Long known for its services to the funk with untold re-issues of super rare drops, Tramp Records also occasionally likes to release completely new material – if it possesses the requisite soul vibes. So much so in fact that they’ve created new imprint Tramp Tapes specially for such material. 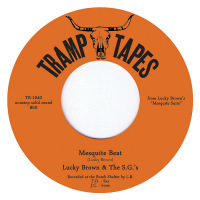 The debut seven inch drop finds deep funk man Lucky Brown teaming up with soul quartet The SGs for some instrumental action on Mesquite Beat. But while it speaks partly of border cantinas in one-mule towns and drinks made of equal parts rattlesnake venom and peyote tea, the vibe is so earthy there’s an almost afro-beat element to things. Expect to find spit and sawdust rhythms, folksy flutes and yourself squinting into harsh sunlight whilst rolling a cigarillo between your teeth. that is a great review! gracias amigios!